Luisa is fifteen years old and a very pretty young girl. In school life, she takes the role of the friendly, shy and overly calm girl who especially flourishes when reciting verses by heart or when singing songs. In other situations, she stays very calm and sometimes even seems to be withdrawn from what is happening around her. If you spend more time together with her, you will notice how much she tries to be integrated in the social life around her, but also how she does not know how to go about it. When you talk to her, she rarely looks at her conversation partner and she often seems to answer inadequately to specific questions. Nevertheless, her vocabulary is very felicitous, although sometimes you feel like she actually does not want to listen to what you yourself have to tell. Luisa is diagnosed with high-functioning autism. A lack of social understanding, a limited ability in conducting a reciprocal conversation and a repetitive repertoire of interests are the main symptoms of high-functioning autism. I work with Luisa and many times, I had to experience a hindered communication due to her problems of understanding the meaning of what other people say, or how to use speech appropriately herself. This is why I chose this topic. The first part of this paper deals with the attempt to find a definition for Autism, Asperger Syndrome and High-functioning Autism. A general overview of the typical symptoms, diagnosis criteria and especially the difficulties in the pragmatic aspects of language shall be given. In the second part, the theoretical framework of this paper shall be explained. Relevance Theory and the Theory of Mind will be explained in more detail as they both might be able to explain at least some features of the language of individuals with Asperger syndrome and high-functioning autism. 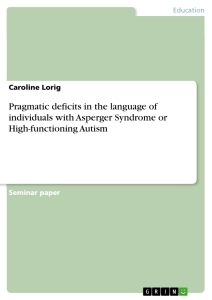 The main part of this paper, however, is concerned with the pragmatic deficits in the language of people with Asperger syndrome and high-functioning autism, exemplified and explained in more detail by means of several sample utterances. Autism is considered to be one of the most severe of all the childhood psychiatric conditions (cf. Baron-Cohen 1995, 60). It is a rare condition, affecting approximately 4 in every 10 000 children (cf. Baron-Cohen et. al 1985, 37). It is a life-long disorder. The main symptom, which can reliably be identified, is that the social development as well as the development of the verbal as well as the nonverbal communication is clearly abnormal within the first years of life (cf. ibd.). Individuals with autism are claimed to have a profound disorder in understanding and especially in coping with their social environment; they, in general, are likely to fail in developing normal social relationships (cf. Baron-Cohen et. al. 1985, 37f.). In the main, there is a great diversity of manifestations of social, imagination and communicative impairments. Still, pervasive developmental disorders such as autism are also characterized by restricted and repetitive patterns of behaviour. As this paper is specifically concerned with the pragmatic aspects of the language produced by individuals with autism, some of the symptomatical impairments in the social communication shall be outlined in the following passage (Please note: language problems vary significantly from one individual with autism to another). - poor comprehension and a lack of use of facial expressions, gestures, intonation etc. Furthermore, people with autism often show certain features, such as echolalia, pronoun reversal or extreme literalness (understanding what the words literally mean, and not the speaker’s intended meaning) or repetitions (cf. ibd., 25). The core features of this syndrome are, according to this, a lack of social understanding and interaction, a limited ability to have a conversation, a tendency to a stereotypical behavioural pattern and an intense interest in one or several particular subjects with no general retardation in their cognitive development. Thus, individuals with Asperger syndrome have features shared with other autistic disorders, but do also show concise traits which differ from other autistic disorders (cf. Attwood, T. 2007, 12). Furthermore, Asperger syndrome is characterized by a normal language development (excluding the pragmatic language skills). People with Asperger syndrome often describe themselves as being socially isolated which is not caused by a willing drawback from the outer world, but rather by their inability to understand the unwritten rules of the social cooperation. Their lack of sensibility (e.g. while trying to interpret feelings, wishes or specific utterances) is often described to be a disorder of empathy or a lack of the Theory of Mind which shall be elaborated on further in chapter 3.2. Some professionals use the terms “Asperger syndrome” and “High-functioning autism” interchangeably, whereas others argue that these two kinds of autism are different conditions although, in some cases, there might be a special relation between them. Thus, the term “high- functioning autism” cannot be found as an independent diagnostic analysis in any official diagnostic system such as the term “Asperger syndrome”. According to the ICD-10, the childhood development of individuals with high-functioning autism corresponds to the criteria of Childhood autism (F 84.0), but they indeed develop a higher intelligence level (in contrast to individuals with “typical” childhood autism). Hence, the term “high-functioning autism” is used informally with the purpose to describe an autism not associated with mental retardation (cf. Mesibov et. al. 2001, 5). Children who are diagnosed with high-functioning autism show, in general, a delayed language development, but often they are able to reach the same level of language skills in adulthood, which leads to the fact that adult individuals with high-functioning autism often cannot be distinguished from adults with Asperger syndrome. The superior motor skills shown by individuals with high-functioning autism in comparison to the clumsiness observed in people with Asperger syndrome is another distinction that can be made. The Relevance of Pragmatic Features for the Creation of Humor in the Television Series "Family Guy"
Language in use: The pragmatical term politeness in reference to the serial "Friends"